General Sir George White, V.C. A cabinet card portrait of General Sir George White (1835-1912), an officer of the British Army and recipient of the Victoria Cross, the highest award for gallantry in the face of the enemy that can be awarded to British and Commonwealth forces. Born at Rock Castle in Portstewart, County Derry, he was educated at King William’s College on the Isle of Man and Bromsgrove School in Worcestershire. After graduating from Sandhurst, he was commissioned into the 27th (Inniskilling) Regiment of Foot and saw service in the Indian Mutiny. 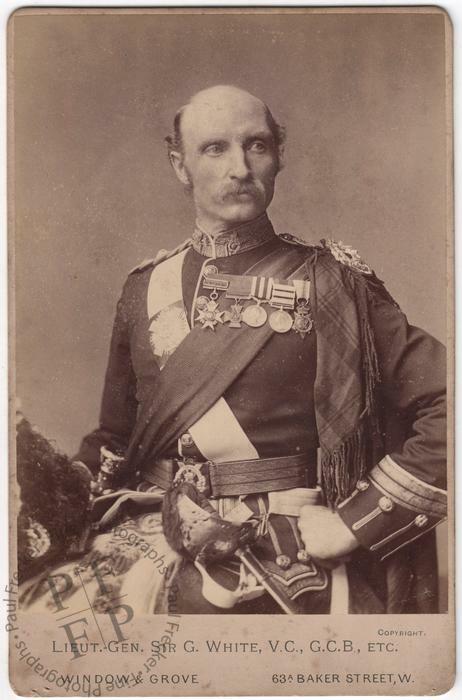 He fought in the Second Afghan War in 1879 as second-in-command of the 92nd Regiment of Foot (later the Gordon Highlanders). He was awarded his Victoria Cross when he was 44 years old, for his actions during an engagement at Charasiah in Afghanistan on 6 October 1879. In 1881 he became the commanding officer of the 92nd Foot. He was knighted in 1886 for his military service in Burma and in 1893 he became the Commander-in-Chief in India. He was commander of the garrison at the Siege of Ladysmith (1899-1900) during the Second Boer War. From 1900 to 1904 he served as Governor of Gibraltar and in 1903 he was made field marshal. He died in the Chelsea Hospital on 24 June 1912. His statue stands in London’s Portland Place and his Victoria Cross is on display at the Gordon Highlanders Museum in Aberdeen. Photographed by Window and Grove of Baker Street, London. Condition: the print presents some fine spotting but has very good tonal range. The mount presents some heavy foxing verso and some fainter foxing recto in the lower margin; it is otherwise clean, firm and solid.